As usual, I’ve also posted this review in my FP blog. A good review and I like this ink a lot too. I've a few other similar Noodler's colours and they all have their 'personal' slant on the same sort of colour. Even I can tell the difference! Thanks for the review. I have been thinking about getting a bottle of 54th Mass., and your review convinced me. Your review is very complete and it also was fun to read. Thanks. As much as I loved the <a href="http://libpens.org/2012/06/07/noodlers-libertys-elysium-ink/">Noodler's Liberty's Elysium</a> ink, I wasn't 100% happy with its non-fully <i>waterproofness</i>, so last December I decided to continue my quest to find the perfect blue ink. After watching a video about <a href="http://www.inknouvea... 54<sup>th</sup> Massachussets</a> at <a href="http://gouletpens.com">Goulet Pens</a>, I passed an order of a bottle of 54<sup>th</sup> M. and another of <a href="http://www.gouletpens.com/Noodlers_Polar_Blue_Ink_4_5oz_p/n19805.htm">Noodler's Polar Blue</a>. I will review the Polar Blue another day, today I wanted to speak about this wonderful and beautiful blue-black ink. The only thing I don't fully love is color, a bit to dark for me. It's very (very!) saturated, with little shading, I guess I'm going to dilute it a bit next time to reduce saturation and see if it does some shading and a bluer color. It doesn't feathers, even on bad paper, and that's a big positive point for me (and Polar Blue and its Black sister, aren't great on that area). 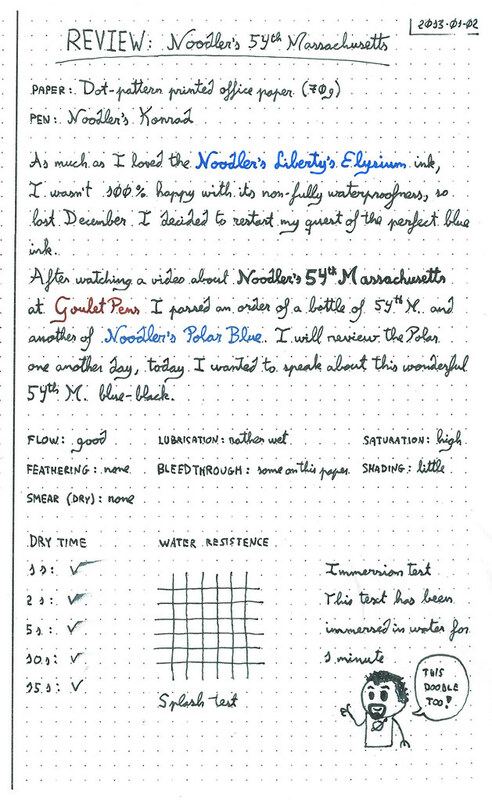 It's <i>waterproofness</i> is really stunning, as usual in Noodler's bulletproof inks (besides Liberty's Elysium). It flows good on my Noodler's Konrad, I had read it was somewhat dry or hard-starting, I haven't found it so.  As usual, I’ve also posted this review in <a href="http://libpens.org/2...ssetts-ink/">my FP blog</a>. I have 6 different bottles of Noodler's including 54th Massachusetts, Liberty's Elysium, Ottoman Azure and Upper Ganges. I am kind of disappointed with Upper Ganges because I find it tend to fade to a lighter shade of blue after putting it on paper. Does anyone have similar experience with it? Try it and let us know what you think. Thanks a lot for the compliment! Glad you liked it! Edited by heymatthew, 05 January 2013 - 14:49. I'm a big Noodler's fan too. If want a little more blue in your blue-black, try Noodler's Bad Blue Heron. I really love that color too. I have both 54th Mass, and Bad Blue Heron. I like them both. The Blue Heron is a great bulletproof blue-black blend with more blue's than the 54th. Nice color. I also have Noodlers's Liberty's Elysium and their Polar Blue. I'm not crazy about the Polar Blue. It tend to go on a really nice blue then dries to an ash blue with heavy feathering. I've got a sample of the 54th Mass. I love the color and the waterproofness. It did not like my Pilot 78G right away, though. It took a fair amount of cleaning to get this ink to flow decently. It works very well now. I love seeing reviews like this where you can't even tell that water was applied to this ink. Really amazing stuff. Just today I received a bottle of 54th and a white Safari 1.1 Inked it up (after flushing with distilled water and a drop of dish soap), wrote a bit and water tested it. Could not be happier. Terrific color, nice flow and very water resistant - to the point that the printed lines on an Ampad gold tablet rubbed off but the ink stayed clear as a bell. If you like this color, I don't think you will be disappointed. I'm another fan of this ink. I like the color as it provides a bit of character that a black or blue would not offer. I've been using this ink for the past month and like it very much. The combination of 54th Mass and a Pilot Metropolitan is hard to beat. I was traveling over the holidays and wrote all my postcards with this. Zero problems. I also had it in a Monteverde Invincia with a stub nib. The first load of ink went through that pen fine, but with the second the pen had hard start problems. This could very well be the pen - I've flushed it and will load another ink to see if its the Monteverde feed that's acting up. Have you tried Bad Belted Kingfisher? Bluer and waterproof,too. Good review. But I would like a more blue ink. So, I have mixed 54th with Bad Blue Heron in various ratios ranging from 3:1 Bbh:54th to 2:1 54th:BBH. All ratios resulted in color that I liked better than either 54 th or BBH. So far I have not encountered any problems with these blends, and they are all waterproof. This is one of my favorites, too. I need to get a bottle. Edit: Say, has anyone tried mixing a little of this with some Liberty's Elysium? That might give a more blue cast with slightly better waterproofing? Edited by MyDarnSnakeLegs, 22 January 2013 - 00:42. Edited by LostInBrittany, 22 January 2013 - 09:12. I bought this ink, partly based on your review. My preliminary tests show that it's a decent ink in terms of flow, resistance to feathering and bleed-through, but it's just so opaque, especially when dry, it looks like dry mud. Your scans show that it has more color (greenish, blueish), but mine is dark, chalky gray. I am a little disappointed. Your scans show that it has more color (greenish, blueish), but mine is dark, chalky gray. I do think the color is quite muted, and the first scan shows this clearly, IMO. In general I've noticed that my scanner shows blues as more vibrant than they appear to my naked eye. To get a hint of what my scanner shows, I have to use a magnifier and view the ink under full-spectrum white light like the ambient light in my window office during the day (rather than at night with the compact-fluorescent that I use on my desk lamp--note to self: think about a desk lamp that will let me see ink colors better at night). 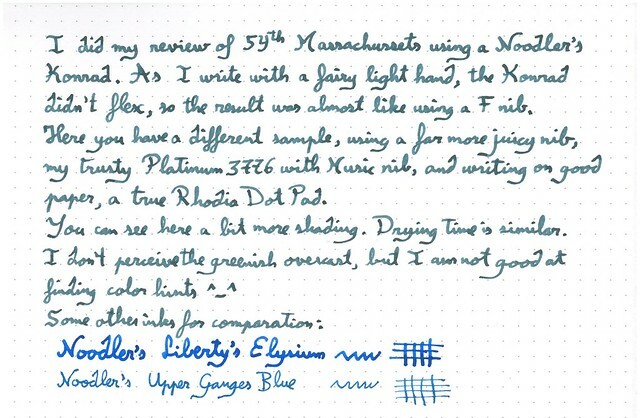 The scan of the ink just above on Rhodia using a music nib on a Platinum 3776 is showing you some of the variation that is inherent with different pens and paper. What color there is in this ink shows up where it is deposited more thinly, so a pen which delivers a wide but not over-wet line will show the most color, whereas a pen which delivers a very wet, saturated line will show the color very sparingly. I had a writing sample with it using a relatively wet pen, and I showed it to a couple of folks who didn't know what it was. I simply asked them to identify the color of the ink. One said (dark) green. The other said bluish-greenish. In both cases I'm certain they came to a conclusion only by looking at the parts of strokes that were least saturated. I have a bottle of 54th and use it every day. I've inked up my Lamy Safari, Cross Townsend, and most impressively in writing terms, my Parker 51 (all fine nibs). I get great shading and pretty quick drying time, even on my Rhodia R-series paper. It gives great character to my writing and is much "cooler" than the black my colleagues use in their ball points or Pilot G-2s. What I also love about so many of Noodlers' inks are the incredible art work on the labels. It really makes you want to show them off on your desk. 54th has great art work as does Noodlers Libtery's and even Purple Heart. P.S. Nathan Tardif's and Brian Goulet's video review are great too if anyone out there wants more.